Reykjavik is the capital of Iceland and it makes a good base for exploring the island. There are several hostels throughout the city and some good options for groups of travelers. Whether you're traveling with a school group, educational program, family, or friends, there is likely a place that will meet all of your needs. 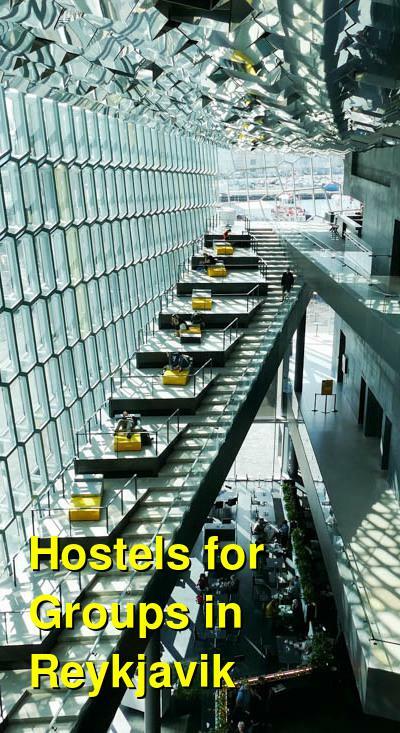 How much do hostels in Reykjavik cost? Reykjavik Downtown Hostel is part of the HI Hostel network. It is highly recommended by travelers and it regularly gets excellent reviews. The hostel is conveniently located very close to the city's harbor area in downtown Reykjavik. It sits on a quiet residential street and is a perfect place to relax after a busy day exploring the city. 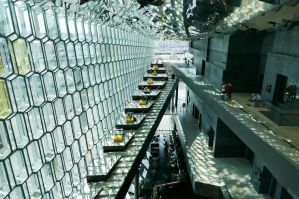 It's just a short walk from many of the city's top attractions including Harpa concert hall and Hallgrimskirkja Church. The hostel has dorm rooms that range in size from four to ten beds. There are also family rooms that sleep up to five people and double rooms that have either shared or private bathrooms. The hostel is eco certified. There is free wi-fi in all of the rooms and lounges. There is also a book exchange, coffee bar, and fully stocked kitchen for guests. There is a buffet breakfast available in the morning. The hostel can accommodate groups as small as ten or as large as 100. The staff can help you organize tours and transportation throughout your visit and meals and packed lunches are available as well. This hostel is actually located outside of Reykjavik city center. It's about a 15 minute drive away in Hafnarfjorour, the home of elves and Vikings. It offers a great compromise between a quiet natural setting and city conveniences. The hostel is perfect for groups that range in size from 10 to 80. There are discounts available for larger groups. The hostel is very affordable and has a great atmosphere for all travel types. The rooms range in size and sleep between two and six people. There is also a "sleeping bag dorm" that sleeps up to 45 people as well as a camping site. Amenities available to guests include free wireless internet access, a fully equipped kitchen and dining area, and breakfast for an extra fee (must be ordered before arrival). The hostel also has an assembly hall that is a great place for meetings or organized events. The hall has tables, chairs, and is equipped for a variety of technologies. It can sit up to 110 people. This hostel specializes in providing accommodation for groups. If you're looking for a facility that can accommodate a large group and offer additional help with planning and coordination, then this is a great option. This hostel is a great budget option for smaller groups that are looking for a fun experience in Reykjavik. The hostel has dorms that sleep four, six and ten people. There are both mixed and female only dorms available. There are also private rooms available for those who want a more quiet experience. Wheelchair accessible rooms are also available. The hostel has many amenities available including a bar area, Boogie Wonderland, which is a great place to hang out and meet other travelers. Many travelers pass some time in the bar playing games or getting to know the staff. The hostel is located just a ten minute walk from the Reykjavik center. The hostel is a "green" hostel that is eco-friendly and uses fair trade goods. It's an upbeat and cheerful place to stay that it perfect to smaller groups. Kex Hostel is located in an old biscuit factory in the middle of Reykjavik. It's just minutes from many of the city's best bars, clubs, and music venues. It's also very close to the city's most popular tourist attractions. The hostel has a lot of amenities for guests including a cafe and bar, a lounge area, a heated indoor patio, tourist information, laundry facilities, and even a small fitness area. Two kitchenettes are available to guests as well and there is free wi-fi throughout. This hostel is a great option for small groups because they have private family rooms that sleep between four and six people. Cribs or extra beds can also be added to the room. In addition to larger dorm rooms, there are several different styles of double rooms. Some have private bathrooms, while others are shared. There are also female only dorms available. In total, the hostel has 138 beds.